Halloween isn't even here yet but I've got a sneak peek at two of the polishes from Orly's Sparkle Christmas Collection. There are six polishes in the collection, but these were the two that jumped out at me to get. 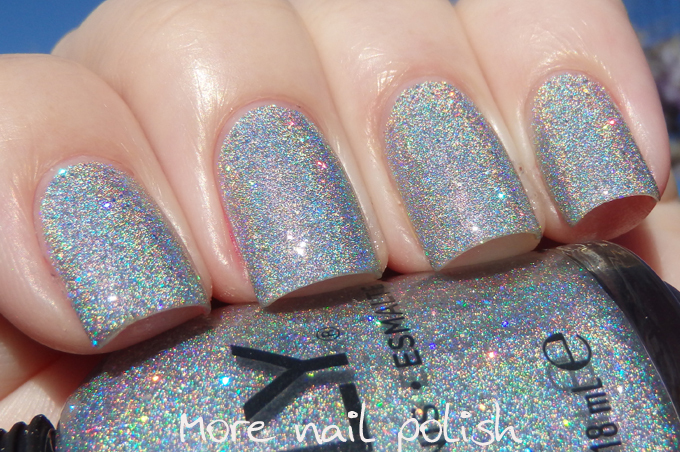 Mirrorball is described by Orly as a silver micro holo glitter, but it's more than just silver holo glitter. 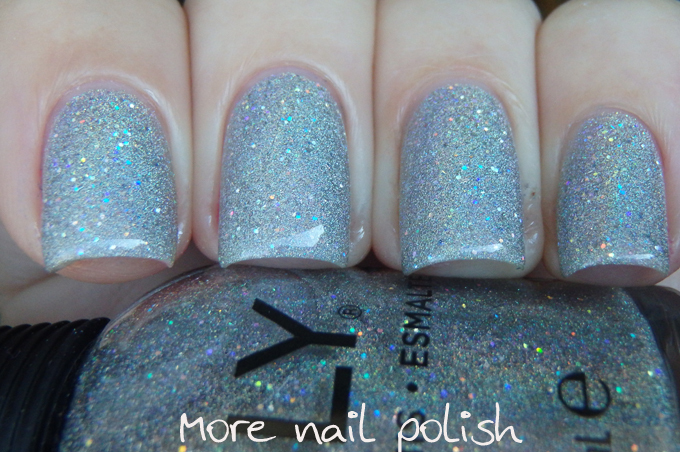 This has some small holo glitters, but the polish is mainly made up of micro holo dust. The finish is totally smooth and the holo dust creates a soft linear appearance, whilst the larger glitters provide extra sparkle. Coverage is good and the formula is smooth and easy to apply. You can use it at one thin coat as a holo topper, or you can achieve opacity at three coats on it's own. This is three coats with seche vite top coat. These two photos taken in the shade really show up the size difference between the holo glitter and the holo dust. Bling is described as a gold micro holo glitter, so in other words, it's the gold twin of Mirrorball. Although they are described as the same, their finishes are quite different. Bling is made up purely of micro fine gold holo glitter. It's very fine, but not a dust like in Mirrorball, therefore there isn't the same linear holo appearance, but the holo sparkle is just dazzling. I was tempted to do one of those deliberately out of focus nail shots just to show how sparkly it is. Like Mirrorball, Bling can be worn as a thin top coat, or as three coats on it's own. The formula is great and it's doesn't get lumpy or thick at three coats. This is three coats with Seche Vite top coat. What do you think of these two shades? I think they are perfect for the holiday season and it's great to see a big international brand coming out with a linear holo polish. It may not be the strongest holo, but the combo of the dust and glitter really brings it to life. I ordered Mirrorball right away, but I have yet to wear it :) It looks so gorgeous! Mirrorball is amazing! If I see that one, I just might have to pick it up. Loooovvveeee Mirrorball, it will be mine! Oh man, both of these are stunning! i bought both this morning...i bought the explosion of fun a week or two ago, which i would recommend to everyone....pictures just doesnt do any justice - at all....the pink glitter in there is like omg and the polish is just ah-maze-zzing!!! i love it, i love it, i love it!! it is one of my favorites!